Algernon William John Clotworthy Skeffington, 12th Viscount Massereene and 5th Viscount Ferrard, was born on 28 November 1873, the eldest son of Clotworthy John Skeffington and Florence Skeffington (nee Whyte-Melville). Educated at Winchester and Sandhurst, he was commissioned as a 2nd lieutenant in the 17th (Duke of Cambridge’s Own) Lancers on 20 February 1895 and was promoted to lieutenant on 13 November that year and captain on 8 February 1900. … took part in operations in Orange Free State Feb. to May 1900, including actions at Vet River and Zand River; in the Transvaal in May and June 1900, including actions near Johannesburg, Pretoria, and Diamond Hill; in Orange River Colony May to 29th Nov. 1900, including action at Caledon River; in Orange River Colony 30th Nov. 1900 to Dec. 1900, Jan. to Feb. 1901, and June 1901 to 31st May 1902. Massereene retired from the army on 18 May 1907 and immediately took up an appointment as a major in the North of Ireland Imperial Yeomanry. In July 1908 he transferred to the newly created North Irish Horse. He commanded A Squadron (Belfast) from 1907 to 1914. He also commanded the UVF’s 3rd Battalion, South Antrim Regiment. 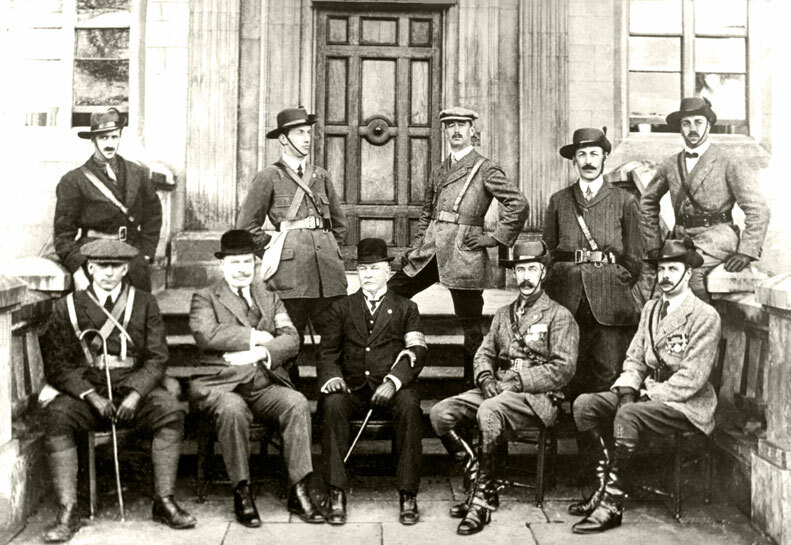 At the outbreak of war Massereene was given command of the regiment’s C Squadron, embarking for France on 20 August 1914. He led the squadron through the retreat from Mons, Advance to the Aisne, and in the subsequent fighting around Ypres. 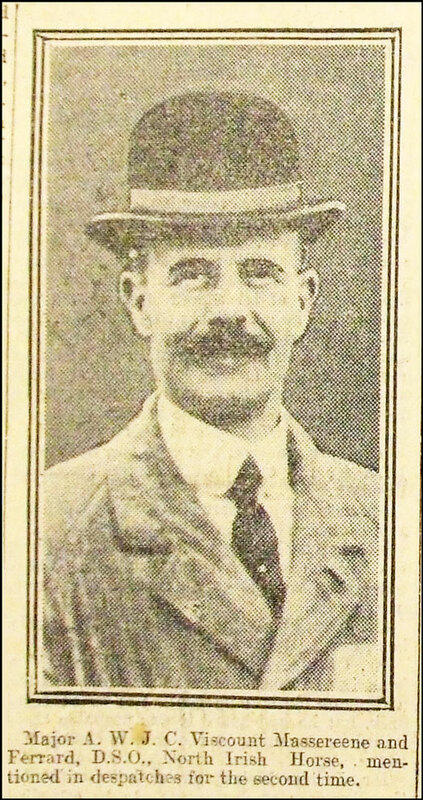 He was twice mentioned in despatches, in October 1914 and February 1915. 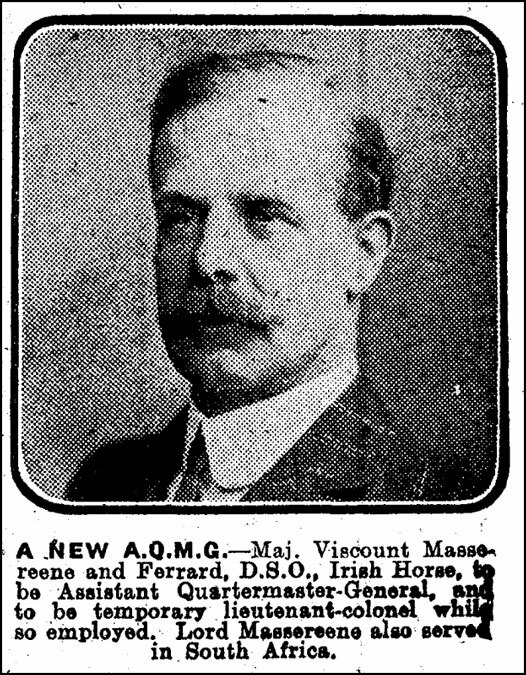 In mid-May 1915 Massereene was appointed Deputy Assistant Adjutant and Quartermaster-General in the Adjutant-General and Quartermaster-General’s staff in Egypt. Later that year he was appointed Assistant Quartermaster-General with the temporary rank of Lieutenant-Colonel. He served in similar General Staff roles throughout the war. 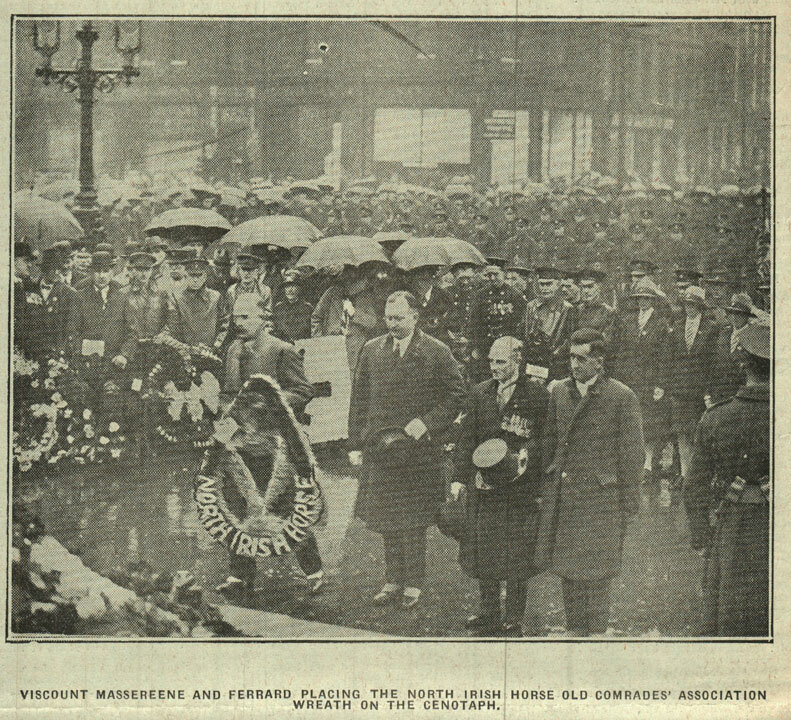 He relinquished his commission in the North Irish Horse on 5 July 1924. Massereene was an Ulster Unionist member of the Senate of Northern Ireland from 1921-29. He died on 20 July 1956. The image above, taken at Antrim Castle, Massereene's family home, shows the local Ulster Volunteer Force hierarchy during Sir Edward Carson's review of the South Antrim UVF in April 1914. Massereene is on the viewer's right, seated. He is wearing his Boer War decorations, including the DSO. 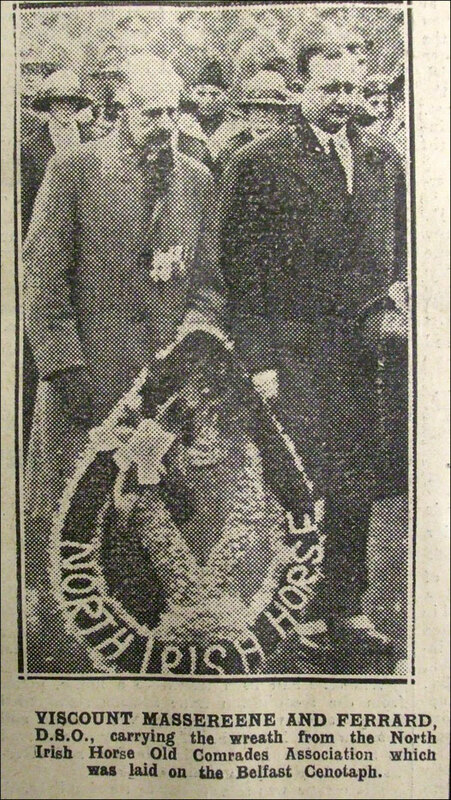 Standing on the viewer's far left is Neil Graham Stewart-Richardson, who would later serve in the North Irish Horse. First, fifth and sixth images, from the Belfast Evening Telegraph and Belfast Newsletter, kindly provided by Nigel Henderson, Researcher at History Hub Ulster (www.greatwarbelfastclippings.com). Second image provided by Alvin McCaig. Third image sourced from www.bygonedays.net.